Chinese army hackers have systematically stolen secrets from U.S. corporations for at least seven years, according to an extensive report from cybersecurity firm Mandiant.This aggressive action warrants a strong U.S. response. Unfortunately, America appears to have only one viable option, which could take years to pay off: diplomacy. On Wednesday the Obama administration said as much when it announced its Strategy on Mitigating the Theft of U.S. Trade Secrets. The plan seems to be lacking teeth as it states only that the Justice Department “will continue to make the investigation and prosecution of trade secret theft by foreign competitors and foreign governments a top priority” while talking a lot about beefing up security against incoming attacks. Nevertheless, here are America’s other options, and why they won’t work. Fines will be ineffective as long as China can deny accountability, which they have already done, calling Mandiant’s report deeply flawed. China could also claim that it doesn’t have control over the hackers. “The Chinese can say we’re victims too, and they probably are,” Brookings Fellow Dr. Jonathan D. Pollack told BI. The next step would be to appeal to the U.N.
International law expert Dr. Wolff Heintschel von Heinegg told BI that the evidence that China violated America’s intellectual property rights and sovereignty “is quite impressive.” This could be sufficient to demand an international investigation. “We could say, ‘what we really want is access to that building in Shanghai,'” said Pollack. If U.N. inspectors were denied access the facilities, then the denial could be taken as prima facie evidence of wrongdoing. That’s when room would be cleared for more aggressive diplomatic actions, like economic sanctions. Still, with the U.S. so entangled with China economically, that course of action is clearly not a good one. Pollack pointed out that Coca Cola was a victim of alleged Chinese hacks, but at the same time, Coke is spending billions on access and marketing to Chinese consumers. “Do we really want a trade war with China?” Asks Dr. Martin Libicki, a senior management scientist and cyber security specialist at the Rand Corporation (who also holds a Ph.D. in economics). Furthermore, America first needs to find out how much damage Chinese hackers have done before any meaningful economic action is likely to pass through Congress. Meanwhile, physical force is not a reasonable option. Outgoing defence Secretary Leon Panetta said last year that the U.S. could respond with physical force to a cyberattack that causes “physical destruction and loss of life,” but China has contained itself to stealing corporate secrets. Though China might have illegally gathered information on critical infrastructure, it has not tampered with or attempted to destroy it. “That type of cyber event would constitute an act of war,” says David B. Lacquement, a former Army general in charge of operations for U.S. Cyber Command, and currently an expert in cyber security with Science Applications International Corporation, a firm that works closely with the government, as well as private entities, on cyber security. Libicki said initial attempts at reaching to China’s military leaders will likely be “brushed aside,” and China is unlikely to stop the hackers on its own. For now, corporations may have to take defence into their own hands. Private companies and their defenses are “woefully behind the power curve” compared to state-sponsored actors, he said. Lacquement and colleague Charles E. Beard, Jr., Chief Information Officer for SAIC, said while these companies wait for international legal action to develop, they can be boosting their own defenses. The answer, the two said, falls in line with the administration’s recent executive order on information exchanges between government and private entities. 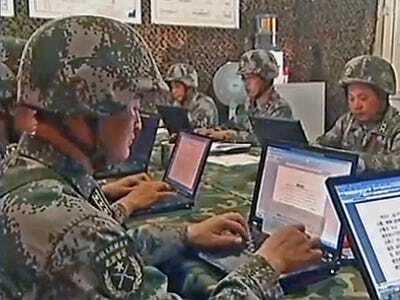 china cyber security cyberwarfare defense-us hacking infosec u.s.